4 topped handfuls of flour. About4-6 dl / 2 cups. Add the flour onto a board and make a well in it. So it looks like a volcano. Put the eggs into the flour well. Knead the flour and eggs together. When the dough becomes more hard, you should knead it by pressing it flat and folding it in half. Continue with that for about 10-15 minutes. If the dough becomes too dry and brittle you should add a little water. If it is very hard, then add an additional egg. If it is too wet, just add more flour. When the dough is smooth and looks like puddy or marzipan, it is finished. When the gluten is pulled out of the flour it becomes very eleastic. If you try to roll it out at once, it will contract immediately. Therefore, you should allow it to rest for 15-30 minutes. This causes the gluten to relax, and it is much easier to roll out. 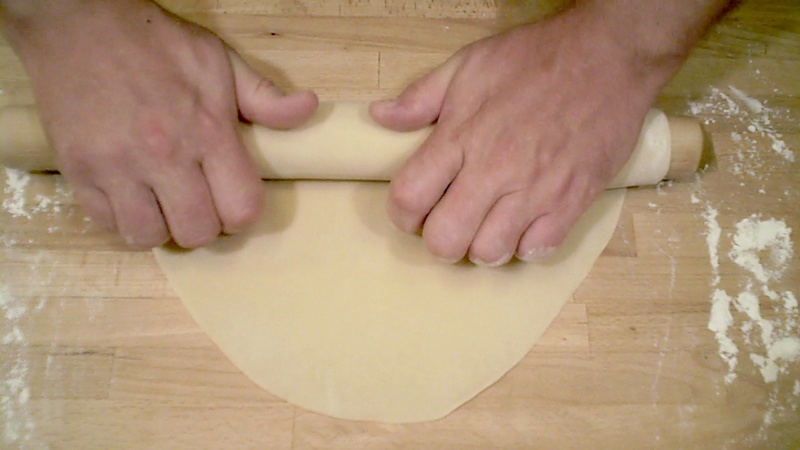 Use a rolling pin, which only consists of a round stick to roll the pasta flat with. A sawed-off broomstick is quite excellent. When the dough is so thin that it is difficult to roll it out any flatter then flour the dough and roll around the rolling pin. 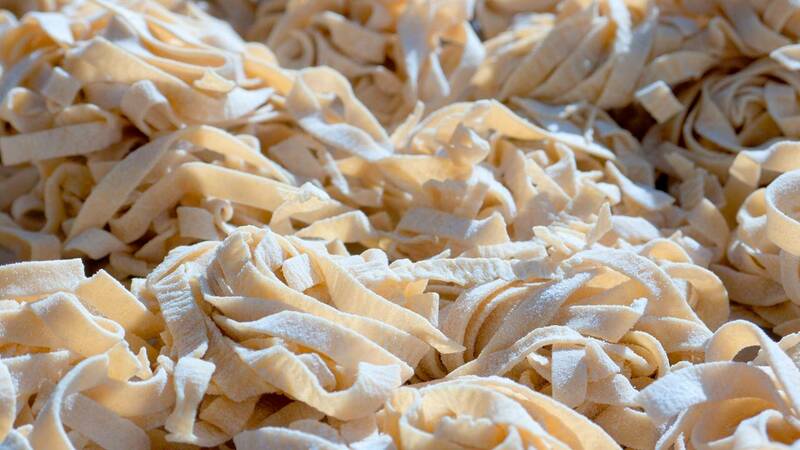 Make sure there is plenty flour on the pasta. It's quite irritating all of a sudden to be left with dough-roll on the rolling pins which can not be separated into layers. Just dip your hands in flour and then spread it over the dough with your palms. 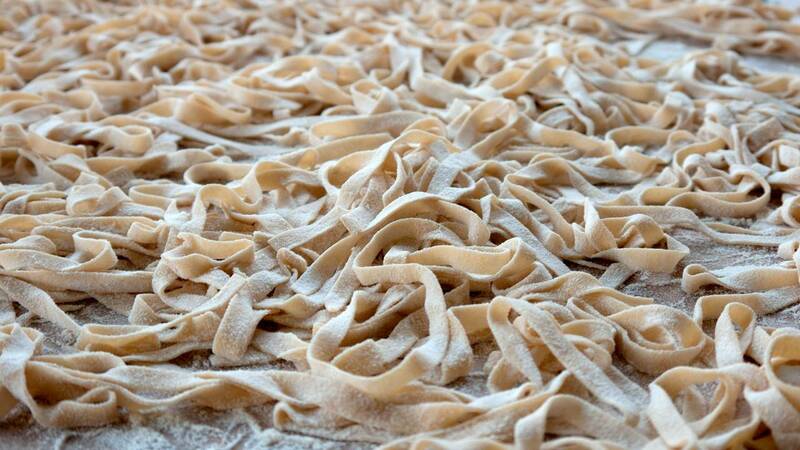 The more wet your pasta dough is, the more flour must be put on. Unfortunately, it is a craft, so it does takes a little practice to get the feel for it. Once you've got the pasta rolled into a thinner plate then roll it of the rolling ping, add flour repeat. Roll the pasta around the rolling pin one last time, and cut along the length in a single incision that cuts through all the pasta layers. Then you get oblong lasagna plates. 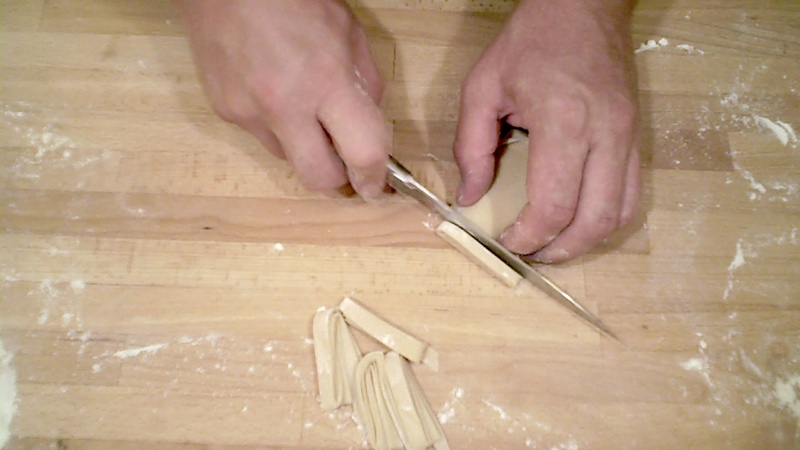 If you are making pasta strips. 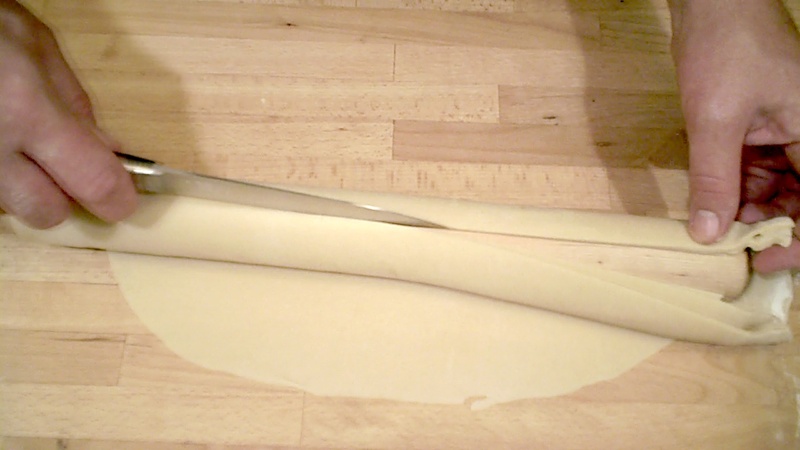 Either the wide tagliatelle or thin spaghetti, then you just fold the lasagne sheets together lengthwise. Fold them in half, and then fold the two layers again etc... etc... Until you have a "sausage" that you can cut into "slices" that each will be a pasta strip.